With the release of iCloud Drive I decided to move all of my data to iCloud. I spend $36 a year on 200 GB of iCloud storage. I moved all of my documents from my local hard drive to the iCloud drive. In the process of moving my files over to iCloud drive I also bought a few iOS and Mac applications to use with iCloud drive. I decided if I was going to go all in on iCloud and iCloud Drive I need to have the proper applications so that I can seamlessly move between my iPhone iPad and Mac. When moving to iCloud and iCloud enabled applications I stopped using all of my other apps that don’t have iCloud integration. This cost a bit of money but in the end I found it’s very worth it. The good news is that apps on the App Store offer a lot of functionality for very little money. Plus, they are optimized for iPhone iPad and Mac, so they’ll run much faster than other types of apps designed for different platforms that bring a lot of baggage. I found the easiest way to migrate files to iCloud enabled applications was to use my old applications and create brand-new files in the iCloud applications. So, for example, I had a bunch of Microsoft Word Files in a folder on my hard drive that were a decade old. I’m now using Apple Pages which supports iCloud Drive. I copied the content of the Word Documents manually, copying the text to a fresh new Pages file (using paste and match style command) so none of the old gunk from the Word document came into the new file. I did this Apple Numbers and Microsoft Excel files and other files. I feel like if you are moving all your files to a new platform the files should be created just like they are brand new. They should be formatted in a new way as well, using the tools and colors offered in the new applications. For files that have no iCloud application I just left them in regular folders in my iCloud Drive on my Mac. You need OS X Yosemite to view iCloud Drive on a Mac . 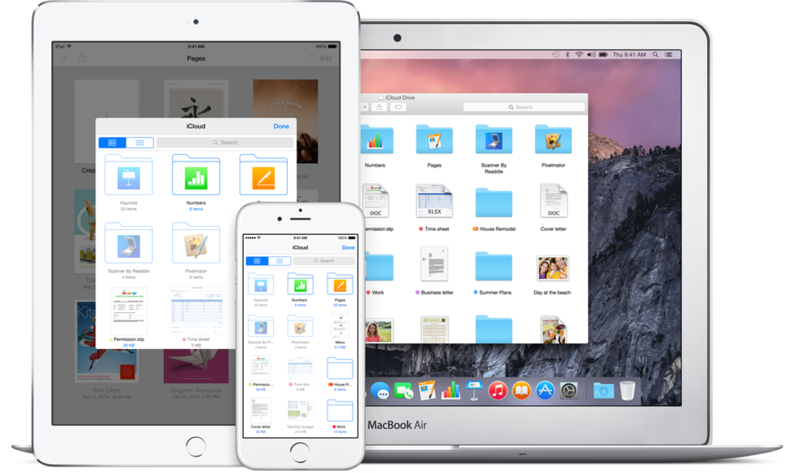 You can upgrade to many storage plans for iCloud Drive. I’m staying with 20GB for now until the new iCloud Photos app arrives on the Mac. I have 80 GB of photos and videos and I’m not moving them until the app that supports them is ready (spring 2015). The new Photos App is available and I moved my photos and videos there where they can be synced across all my devices. VERY convenient. All edits to photos I make also sync, as well as deleted photos. I moved all my calendar and Mail data from Google to iCloud. So far they have worked well and offer push notifications which means they get updates and messages get delivered instantly and don’t use much battery power. I find the server-side mail rules for Apple Mail are weak, however, and the mail rules don’t sync within the iOS apps because there is no way to access mail rules. So, I have to setup rules on iCloud.com. Another problem I found is that I can’t turn off junk mail filtering on the iCloud server, so about 1 email a week ends up in the junk folder. Sometimes I don’t notice them for a while. Luckily, it’s never been an important email. But do check the junk folder. I used the Mac Mail app to copy emails from my Gmail account to my iCloud account via copy / paste. It uploads the Gmail messages to iCloud that way. That’s a one-time process once you get everything synced. It took awhile for my messages to sync on my iOS devices and I have to continually pull down the message list to get all the emails to download and show up in the proper order. I still use Gmail as my main email address and have it archive incoming messages and then forward them to my iCloud account. That way I have a record of all mail as well as a backup. With family sharing on iCloud, I share a family calendar so I can add and modify events for my whole family that get updated in real-time. When you create a family sharing plan you also get photo sharing between family members. This is pretty convenient and makes sharing photos easy with just the touch of a button. When you activate iCloud photo sharing, all your photos are synced via the cloud and get stored in their original file format and size. This is great since if there is ever a fire in your house all your photos are stored remotely in the cloud and on all your devices. I’ll pay a few dollars a month for the extra storage space for the peace of mind. One of Steve Jobs’ favorite sayings about the mac and iOS was “it just works.” Because Apple has a lot of control over the hardware and software, it can make great experiences. For me, choosing software for mac and iOS that is updated frequently and leverages the new technologies of the new operating systems like OS X Yosemite and iOS 8 provide me with a smooth work and entertainment experience. More and more, choosing apps that play well with the Apple ecosystem is so important. Why? Because when developers code programs, they will expect users to have the software that they think they should. So, when you use unpopular tools and apps, weird things can happen. And you don’t want to spend time debugging weird things. One thing to note about using iCloud at work: it may not work at all. iCloud is considered a personal storage platform, and many workplaces block access to all things iCloud – iCloud.com, app downloads, mail, etc. The way around this is to use your own iPhone or iPad data network. This is a major bummer, but as long as you have a decent data plan, it’s not much a problem. How’s My New iCloud Home? I’ve been critical of the iPad since it’s release for having lousy software. Almost 5 years later the software is ready and iCloud Drive and sync has been working great for me. It simplifies my life. Time is the new currency and iCloud gives you gold bars. How do you reconcile the blatant privacy issues with major cloud storage? Nothing to hide? All aggregated data is useful for population response modeling. Then there is the ever present risk of a social hack (has been done and demonstrated) where your iCloud account gets pawnd and “all your stuff are belonging to us now”. When you put all your eggs in one basket, aren’t you just asking for “it”? As a technology professional, aren’t these concerns of yours, and if not, why not? Good points, Max. I think most people nowadays assume their information will be hacked when it’s in the cloud. Local backups is key. As long as you can restore your content and files, it’s worth the risk to me. The convenience is too great. Do you have some resources for people with something to hide? Might be useful to list. Are you still enjoying you iCloud experience? Debating whether or not to move everything from Google to iCloud myself? I’ve had a few emails not deliver from iCloud so the trust is not 100% there. Would appreciate any feedback. Thanks. I’ve been using iCloud for a while now and I’ve had just a few problems. When I went out of the country my photos wouldn’t upload to the cloud until I got back to USA. Also, when I came back my iCloud Drive wouldn’t sync on my phone. I had to fully clean install on my new iPhone 7+. After the clean install it worked fine. I use reading list for Safari often. It doesn’t sync sometimes and not all of my list is available offline on my devices. Other than those fairly minor issues everything is working fine.